FIREBALL - (1m/1f) Gerry returns home from shopping to reveal a huge hole burned into his sweater. His explanation is that a fireball dropped out of the sky and hit him in the chest. Jennine knows better. MOTHER GOOSE AND THE COMA - (1f) Polly explains why she's leaving her boyfriend, who's currently in a coma. HOW DOES YOUR GARDEN GROW? - (2f) A garden comes between two neighbors. PANCAKE TUESDAY - (3m) The business has gone belly up. Foster, Lewis, and Ed end up on the roof of their office building preparing to jump. Will their constant arguing keep them alive or quicken the sidewalk splat? DOWN - (2m/1f) Geoffrey is headed to hell. He is accused of being a glutton, despite being an uber fit, no fat, vegetarian. 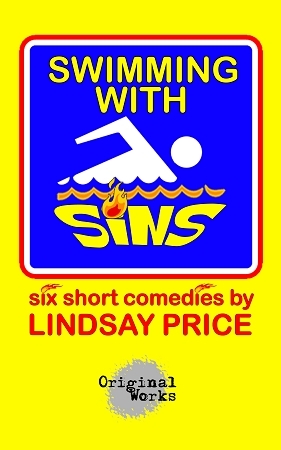 SWIMMING WITH SINS - (2m/4f) Vices and Virtues get together for their annual camp swim meet. Envy decides she's had enough of being a vice and wants to switch camps. "Smart, skilled writing... well-crafted material." "...fascinating flesh to the bone..."
"Price's images and dialogue are vivid."